While this is only my third venture into the world of Pathfinder Tales, I swear the experience is only getting better with each book. And my latest read, Shy Knives, just completely stole the show. Backing up a bit though, I was excited when I first learned that the wickedly funny Sam Sykes had been asked by Paizo to write a novel for them and that he would be joining the Pathfinder fun, but I think I would have jumped on this book even if I hadn’t been getting into the series already. I knew I was going to enjoy myself, but still—I had no idea just how much! Shaia Ratani, Shy to her friends, is a scrappy young scoundrel who specializes in the kind of jobs that no one else can handle. For one thing, she’s not afraid to work outside the law. For another, she’s also not above getting her hands dirty. She has cheated, stolen, maimed, and killed—and though she doesn’t exactly condone or relish doing harm to others, it’s not like she can afford to regret her past decisions either. Sometimes a job is just a job, and nothing personal. One day, Shy is approached by a young noblewoman with an interesting case. The Lady Dalaris Sidara is the sole remaining heir to a destitute house, her already precarious future shattered by the death of her betrothed just days before their wedding. They said that her fiancé had simply been in the wrong place at the wrong time, overseeing his family’s trade business at a caravan stop when it was attacked by a marauding band of centaurs, but Dalaris suspects that there is more to the story. With the other nobles watching her like a hawk, she needs someone resourceful like our protagonist to poke around and shake out the truth. Some jobs may require heroes, but this one definitely calls for a rogue. I loved the characters in this book. Shy’s voice is as delightful as they come, with her sharp mind and sharper tongue. Sam Sykes did a wonderful job with her personality, finding that perfect balance between “hardened criminal” and “rogue with a heart of gold” so that Shy came across as lovable protagonist without being too mawkishly sentimental. She also won me over from the very first page with her clever wit and hilarious anecdotes and one-liners. I could probably fill a dozen pages with my favorite quotes, easy. In multiple places, this book literally had me laughing out loud. Then there’s Dalaris. My favorite description of her comes near the end, from an observation by Shy herself: “There are two types of people in this world: tough people beneath a layer of tears and teary people beneath a layer of toughness. Dalaris, thankfully, was the former.” Despite the relationship getting off to a rough start, this unassuming and ostensibly meek noblewoman ultimately earns Shy’s respect and friendship, and it’s easy to understand why once you get to know her strength (as well as some mind-blowing revelations about her past). Now that I have three Pathfinder Tales novels under my belt, I’m also struck by the variety of stories. Despite them all taking place in the great wide world of Golarion, the setting for many of the events in the Pathfinder RPG, my reading experiences have vastly differed each time. I liked that Shy Knives doesn’t take itself too seriously, keeping a light tone and injecting a healthy dose of dry humor (which even includes several tongue-in-cheek jibes about D&D groups/adventuring parties). I wanted a fun, swashbuckling good read, and that was exactly what I got. At the same time though, the book is also a testament to the increasing quality of media tie-in novels. Their popularity is a growing trend, and nothing to be sneered at. I think entertaining well-written books like this one will keep helping the genre gradually shed its stigma of being disregarded as derivative, unsophisticated, or too commercial. The nice thing too about Pathfinder Tales is that you can pretty much jump in anywhere, as most of the books in this series are written to be standalones (even though some authors will occasionally return to their previously established characters for more stories). 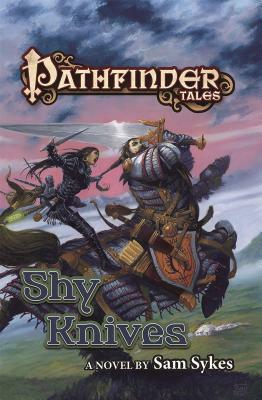 While I have no idea if more Pathfinder novels are in Mr. Sykes’ future, if he does decide to do another one I hope he’ll consider bringing Shy back for another adventure. I just adored her character. Her humor and charms made Shy Knives an absolute pleasure to read, though I wouldn’t hesitate to give this book high marks just for being so damn enjoyable and addictive—so much so that I devoured most of it in one sitting. If I thought hard about it I could probably come up with some flaws, but quite frankly, I was having too much fun to care. Bottom line, if you’ve been curious about Pathfinder Tales, wait no longer—Shy Knives is the one you’ve just got to, have to, need to read. With thanks to Tor Books and Sam Sykes, The BiblioSanctum is pleased to host this giveaway where two lucky winners will each receive a copy of Pathfinder Tales: Shy Knives with signed book plate. This giveaway is open to residents of the US and Canada. To enter, all you have to do is send an email to bibliosanctum@gmail.com with your Name and valid Mailing Address using the subject line “SHY KNIVES” by 11:59pm Eastern time on Friday, October 28, 2016. Only one entry per household, please. Must be at least 18 years old to enter. Two winners will be randomly selected when the giveaway ends and then be notified by email. All information will only be used for the purposes of contacting the winners and sending them their prize. Once the giveaway ends all entry emails will be deleted. As if the “marauding band of centaurs” were not enough 😀 I’m very intrigued by your description of Shy: she’s exactly the kind of character I enjoy reading about. The added bonus is that this series can be approached at any point one chooses, so I guess I will be jumping in as soon as I can. This is one reason why I love the Pathfinder world – so many different beings and creatures, pretty much anything can show up! In this book, yes, the centaurs were awesome even though they were mostly the bad guys. I had so much fun with this! Yeah, good luck against that hulking blade! I love the sound of this – and Shy in particular. I can’t say that I’ve ever been intrigued by a Pathfinder novel before, but you made this one sound amazing! Shy and Dalaris sound like an awesome duo — I love a good female friendship story. Plus I’ve only heard good things about Sam Sykes! I am a great fan of Pathfinder universe. Have a collection of board game already.